With the APS meeting rapidly approaching we thought it would be an opportune time to quickly bring everyone up to speed beforehand with a quick report on our quest to build a facility here in the Central West of NSW. As most of you know, the journey to get our planetarium built has, so far, been a long and convoluted one. At last year’s meeting I was excitedly talking about how Orange City Council had unexpectedly voted to support our project financially. It seemed that our hard work and dogged perseverance over the course of a decade had finally worn them down and they had decided to see the light and come on board with our vision. But like everything so far, things haven’t turned out to be quite as straight forward as we were hoping. Unfortunately, in the current economic climate and with the recent change in federal government throwing regional capital funding into a state of uncertainty, we have had to reassess our project and look for alternatives to our original vision that will increase its chances of securing funding and ultimately going ahead. With this in mind, combined with the financial assistance on offer from council not being as generous as we were first led to believe, we have had to make some compromises. The main thorn in our side is another long time project for Orange. After 15 years in the planning, funding was recently secured by the council to build a museum. With a reasonably high price tag and designs that look uncannily similar to our original designs, the implication for us is that raising the funds for our original concept is now all but impossible. Having said that, it appears that with the museum project now funded and under way it has left the planetarium as the next community project on council’s hit list of things to make happen. Not only that, council is apparently looking at having the planetarium operational sometime in 2015. In order to do this we have had to shave our plans down to essentially just the planetarium and associated spaces. We will also have to relocate from our preferred spot in the picturesque surroundings of the Botanic Gardens to the same precinct as the museum. Although not as aesthetically pleasing, from a functional point of view the change in location isn’t all that bad as it is located in the centre of town and beside the current library, art gallery, civic theatre and visitors centre, as well as the soon to be constructed museum. A couple of images showing the new precinct and concept design for the museum are shown below. The exact location within the precinct is subject to negotiation and I suppose architect whim, but the currently best proposed site for the planetarium building has been pointed out. 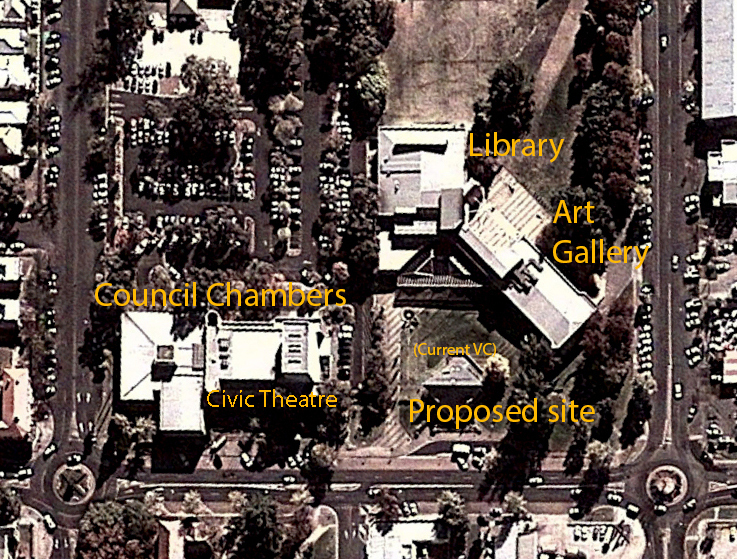 The new location showing the existing council chambers (with civic theatre), library, art gallery and current visitor’s centre. The new museum (which will incorporate a new visitor’s centre) and planetarium will take up the majority of the lower right corner of the block. The site is only one street over and within easy walking distance from the town’s CBD. Concept designs for the new museum/visitor’s centre. A proposed area to locate the planetarium is over the circular feature on the RHS. To give you an idea of scale, the circular feature has a diameter of approximately 20m. The 2015 timeframe is due to Orange Council wanting to have the museum well and truly under way before they start construction of the planetarium. With the museum due to break ground sometime within the next 6 months and estimated to only take 8 months to build, we can of course spend the majority of this coming year getting everything in place, ready for construction to begin as soon as the museum is nearing completion. The architects involved with the design of the museum have already been given instructions to start working on designs that fit in with the architectural ethos of the rest of the precinct. We have been involved with this long enough to know that things aren’t guaranteed until we see our name on the side of the building. There are still quite a few things to work out and negotiate, but it does look like this is our best chance since we began to actually get something built and if it really does go ahead then it will all start to happen this year! We look forward to catching up with everyone at APS where we can go into some more details on where we are up to, as well as hopefully glean as much information as we can before we start the process of determining final designs, systems to use and pitfalls to avoid. So, see you there! This entry was posted in Uncategorized and tagged Orange. Bookmark the permalink.